Montreal, QC – June 6, 2018 – Today, loyal customers, dealership staff, and special dignitaries joined together to celebrate the grand opening of Spinelli Toyota Lachine’s newly relocated dealership - ready to open its doors to the city of Lachine and its surrounding communities. Spinelli Toyota has been a part of the Lachine community for more than half a century and is well known for its sponsorship of many local groups, including the Lachine Hospital Foundation, West Island Community Shares and Garde-Manger Pour Tous. The dealership is a member of the local Chamber of Commerce and a supporter of the Orchestre Symphonique de Montréal. It’s also a must-visit destination when shopping for a new vehicle – and the new showroom and service centre makes that experience even better. 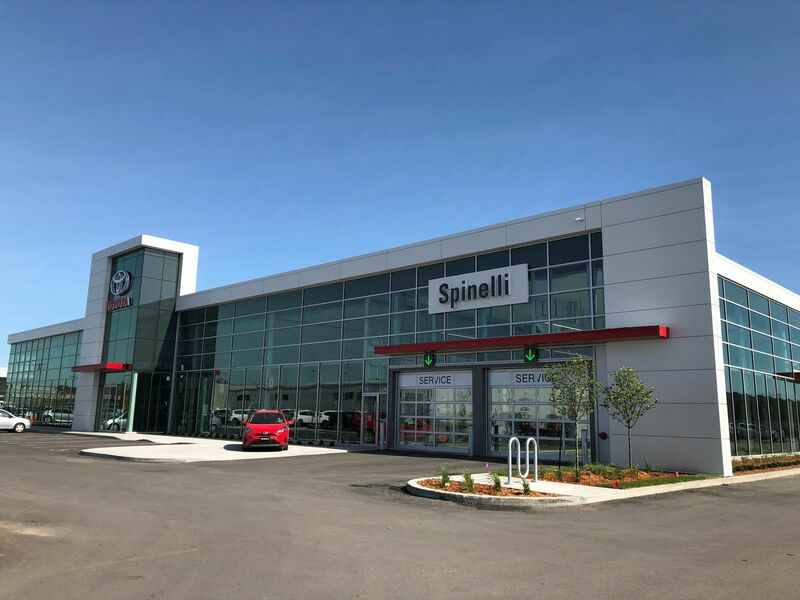 Spinelli Toyota Lachine’s 5,600 sq-ft showroom has display space for 16 new Toyota models, that features floor-to-ceiling windows to flood the display area with natural light. Toyota dealerships have a reputation for excellent customer service, and Spinelli Toyota Lachine continues to demonstrate this. Already known for its world-class body shop work, the dealership’s new maintenance area includes 13 service bays to provide speedy servicing, including Express Lube service. To provide a first-class experience for those waiting for their vehicle to be looked after, the lounge area features Internet service for customers, plus televisions and a Bistro Café open for breakfast and lunch. In addition, having six on-site wash bays means every vehicle can leave the dealership looking great – inside and out. Spinelli Toyota Lachine’s new facility also incorporates a number of features to minimize its environmental footprint – from its HVAC system, to LED lighting on a seasonal controlled timer, to a full recycling program for fluids, metals, batteries, cardboard and other waste generated during the servicing process. Spinelli Toyota Lachine is now located at 200 Montreal-Toronto Boulevard in Lachine, Quebec – just 15 minutes from downtown Montréal and 10 minutes from Montréal-Trudeau International Airport. For more on the dealership, visit www.spinellitoyotalachine.com.